Kingdom Guitars is a Bristol based designer and manufacturer of affordable bespoke electric and bass guitars. Their mission is to “design and manufacture cutting-edge guitar designs with high-end, custom features but at an affordable price range”. So far they have released a couple of six-string electrics, a seven string electric and a four string bass, all in black which gives you some idea of their target market! We had the opportunity to play and review The Dark Defender Special Edition recently and drafted in a couple of players to put it through its paces. They were complimentary about the guitar and thought that it was way more expensive than the price quoted. 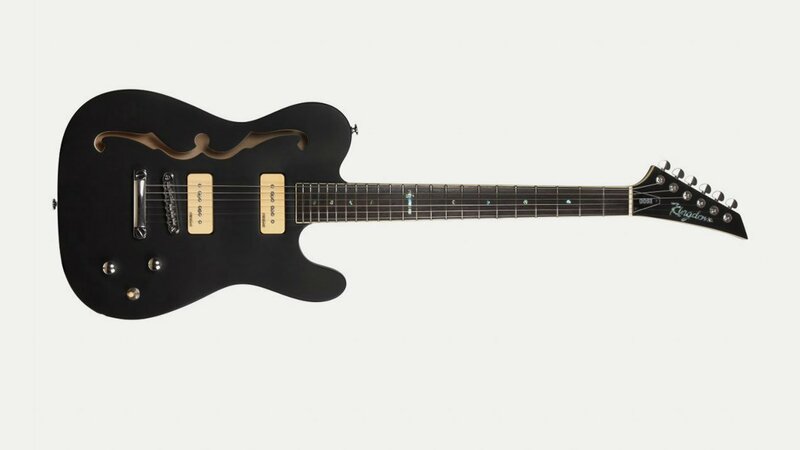 The Dark Defender is a lightweight, nicely balanced and easy to play guitar having a smooth fast neck. The P90’s in the Dark Defender give a great range of tones from smooth jazz, via rock to full on metal tones. • Willow wood, chambered and weight balanced body, finished in matt black with ivory bindings. • ‘Winged’ double f-hole to enhance acoustic properties and sustain. • Wilkinson ‘soapbar’/P90 style pickups, controlled by 1 x volume, 1 x tone and 3-way selector switch. • Wilkinson WJ-303 (1:19 gear ratio) fine-tuning machine heads. • Medium jumbo frets on a C-shaped maple neck, with rosewood fretboard and abalone inlays. • Abalone dot and 12th fret cross inlays for eye-catching aesthetics. • Abalone Kingdom® headstock logo and ivory headstock binding. • Lockable tolex hard case with branded brass tag and fitted plush interior.